“I would like to bring to your attention and complement your company and your outside sales representative Dawson Jehn for his great attitude and help that he provides the C&A Group with their plastic requirements. “I want to formally thank Redwood Plastics for your outstanding Service from the Prince George Store. Your Employees Gerry, Tony, Danny go over and above for customer service. All your staff I speak to are very professional, very accurate on delivery dates and number one with product knowledge, regularly I try or order products I do not need and you knowledgeable staff always steer me to what we really need. I have a lot of very good vendors and very few GREAT ones, your staff is GREAT, We at Carrier greatly value our supplies and consider your company a valuable asset to us. “We contacted Redwood Plastics, inquiring about replacing some urethane bushings for our tumble deburring machine. Our sales rep, came and picked up the sample and got drawings the next day. Redwood provided a quote, which was timely because at the end of that week, the tumble deburring machine broke down (the old bushing blew up), and we were in the middle of a big job for one of our customers. There were many emails and phone calls between myself and Redwood to make sure that they got the part right – checking if the hole on the side of the bushing was to go through both walls or just one, and making sure that it was made out of a stronger hardness material – we used Redco 500 (95A). The part was delivered within 48 hours (on Monday of the next week). 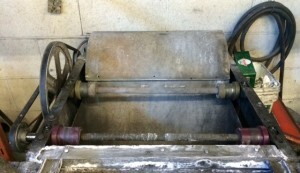 We heated up the bushing and installed it on the tumble deburring machine – it fit perfectly! MoCo – Engineering & Fabrication Inc.
Feeder motor speeds have decreased due to a decrease in friction. There has been less bridging off and plugging of feeders. Cleaning feeders has become significantly easier and takes less time than before. We will continue to monitor the condition of these feeders and compare their performance to other feeders within the system without Tivar 88 installed. I thank both of you for taking time to assist and oversee the installation of these initial feeders. Our guys enjoyed working with you and hope to so again in the future. “As we have concluded our Maintenance Shutdown here in Grand Prairie, I felt it appropriate to extend to you our appreciation for your support. The level of professionalism demonstrated by your employees was very impressive. We have completed the planned work, found work and have now returned to full production, all ahead of schedule. “The damping plates were installed on site and everything seems to work fine up to now. The damping plates reduced significantly the bounce back we did observed on our positioning fences. “Thank you so very much for your kindness and help with the mirrors. Our Child Life Department is THRILLED and the kids are enjoying them already for developmental play.